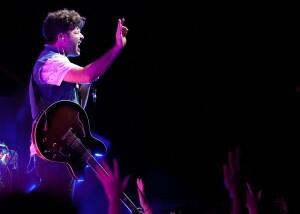 Max Kerman of the Arkells belts it out on Friday night. (Photo by Kate Turner). For more Hillside photos check out Photography Manager Kate Turner’s photo galleries. Through blistering heat, extensive lack of sleep and borderline cases of dehydration, each year volunteers and patrons gear up for what is quite possibly the biggest arts and culture festival in Southwestern Ontario. But “Happy Hillside” they would say — the formal greeting to one another and everyone they see — and not one complaint would be heard. The sound of the music and intimate atmosphere brought people together like they’ve known each other their whole lives. Men, women, kids — anyone is accepted into the Hillside family. The annual Hillside Festival — now in its 29th year — is a three-day, four-stage music and arts festival that ran from July 27-29 at Guelph Lake Island. And it was sold out, clearly indicating that Hillside was going to be a good time. Hillside features musicians from local areas and abroad, spoken word artists and various workshops. To say it’s is a typical music festival would be a mistake — a big one. Unlike larger festivals such as Osheaga — which begins next weekend — and Bonaroo, Hillside maintains a unique and local appeal, something that attracts many different performers. “We’ve been looking forward to this weekend for a long time, ever since we heard about it. Hillside is like one of those festivals that when you’re first starting to play as a band together that you’d aspire to play at,” explained Max Kerman, vocalist and guitarist of Arkells, the final act on the main stage on the first night of the festival. Around Kerman, backstage of the main stage sat the everyday volunteers, everyone chatting and smiling. “They make a conscious effort to invite local music, musicians and workshops and all those kinds of stuff. It makes you feel it’s from Guelph, not just here by chance kind of,” chimed in Kerman’s bandmate, Mike DeAngelis. Nothing could describe that local experience better than when Chad VanGaalen, one of the later acts on Saturday, asked the people in the crowd at the Island Stage to put up their hands if they were from Guelph. Most of the hands flew up into the air and a cheer erupted. But you didn’t have to be from Guelph to feel that community vibe. The festival brings people together from all different walks of life, and so many bands will kill to get a set at Hillside. Bombay Bicycle Club from the United Kingdom and the Jezabels from Australia both put on thrilling sets, and they didn’t need to be from Guelph – or even from this country for that matter – to know they were welcomed. One of the later acts on Saturday, the Bright Light Social Hour, hailing from Austin, Texas, played an energetic, funky set that got people dancing on top of picnic tables. “It’s a small, intimate, cool festival,” said Marti Sarbit, singer of Winnipeg-based Imaginary Cities who played an intense and lively set Saturday night. Sarbit, whose band played for the first time at Hillside, swayed in unison with the crowd as they listened to the soothing sounds of her voice. “I like that, that’s kind of where I’m comfortable I guess, the smaller stuff,” Sarbit added about the setting. “Not to say that this is small, it’s more people than we’ve ever played to,” she laughed. Tenn, after the set of the Rival Boys, said that every band that he’s managed wants to play Hillside the following year. But unless they come out with a new album they can’t play two years in a row. Hillside runs off of its volunteers, and without them everything would fall apart. And the volunteers love it too. They receive their own camping space in the “Volley Village”, accommodations such as food and they get to party with their fellow colleagues. Despite cold rain pounding the tents for the most of Friday night, volunteers drank, and had fun while the chants of songs and the faint sounds of guitars filled the night. The rhythmic sounds of drums, though going well into the early hours of morning, was enough alone to show how enthusiastic these folks were. One volunteer actually happened to lose her sunglasses but found them later at the lost and found. She was dumbfounded that someone didn’t just steal them, but reminded herself of where she was. “Well that’s Hillside for you,” she laughed. Ashley, who chose not to give her last name, volunteered for the first time at Hillside and loved the experience. Another volunteer, who went by the name “Sporty”, has been a long-time volunteer. When asked about how he has felt Hillside has progressed through the years, he responded by saying, “Better and more current bands, but other than that it always been the same. While the music doesn’t embody the whole Hillside experience, it definitely is the main focus for patrons, volunteers and the performers themselves. Though many of the acts tended to be folk or bluegrass, Hillside welcomes pretty much anything. Along with those mentioned before, other notable acts included the foot-stomping sounds of the Strumbellas, the soulful and passionate voice of Cold Specks, indie act the Wooden Sky and young jazz geniuses, BADBADNOTGOOD, who put a fresh spin on popular hip hop and electronic songs. A band such as Half Moon Run, who drove nine hours from Montreal the day of their set, didn’t quite know what to expect of the festival, but with the energy of the crowd they delivered a powerful set. Even if you didn’t know any of the acts prior to the festival, the music didn’t disappoint. It was inevitable that The Cord couldn’t be everywhere at once, but acts such as Rich Aucoin and the solo set of the Constantine’s singer, Bry Webb, generated quite the buzz around the festival. One of the more unique aspects of Hillside had to be the music workshops where two or three artists, sometimes without initially knowing who the other bands were, would collaborate in a jam session. It was a hit or miss, but when it worked – such as the Sunday Gospel Session that happens every year – the music just grew spontaneously and the talent thrived. While another great tradition, Osheaga, kicks off next weekend, Hillside is completely different and warrants it’s own visit even if some of the acts play both festivals. “Osheaga is going to be great and Montreal is an amazing city so it has its own set of appeals,” concluded Kerman of Arkells. Hillside is growing and a certain sense of density can be felt on the grounds, but it appears it hasn’t lost its feel of intimacy and friendliness. The atmosphere, performances and people are all things that shouldn’t be missed, and it’s not unusual for someone to crave another year of Hillside prematurely.